Welcome to the first Podium or Pits of the new year! New Renault test driver... Vladimir Putin? Regular readers may remember the scepticism with which POP greeted the news that Vitaly ‘lacklustre’ Petrov secured an audacious 2 year deal with Renault. “How many wheel-barrows of cash did it take to get that deal done?” is what POP said before Christmas. 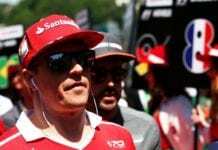 “The number of automobile sport lovers in Russia increases day by day […] Petrov, who is very famous among Formula 1 fans here, has recently signed a new two-year contract with his team [Renault]. He definitely needs support. Financial support most of all.” – Vladimir Putin. *This report is entirely imagined, but you never know, it might be true – just look at FIFA, Sepp Blatter and the awarding of the 2018 Football World Cup to, you guessed it, Russia! POP rests its case. Shake that booty! My oh my, this week Mark Webber has been captured doing his best Saturday Night Fever impression whilst trying out the Xbox Kinect. Sadly for Mark it’s more cringey Dad-dancing at a wedding than the next Strictly Come Dancing champion’s routine. But full marks (to Mark! ), for trying! Many thanks to WTF1 for the tip-off! Get well soon Heikki! And for all the Heikki fans out there POP has also discovered Heikki’s NYE fancy dress outfit… complete with Adam Ant-like eye-liner! Fierce. With a double-whammy POP entry, that can only mean one thing… that’s right, Pat Fry has replaced Chris Dyer as Ferrari’s head of race track engineering. he used to be BBC commentator Martin Brundle’s race engineer! nope, that’s it. Pat isn’t wildly exciting. And finally, POP leaves you with this photo of a yeti, oops, POP meant to say Fernando Alonso, alongside a furry creature with a cat on his shoulder – Do you like Alonso’s and Mark’s new look? 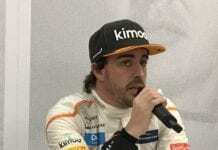 Are beards the means of ‘growing’ a successful championship, ‘out-bloking’ fellow rival drivers, or merely a means of hiding from disgruntled Ferrari fans for Alonso and for proving who’s the real man to your whipper-snapper team mate? YOU DECIDE! All votes will be counted and Alonso’s facial hair will be given a Podium or Pits in next week’s column!